This is a short account of the Echo Parakeet Psittacula eques conservation programme that is run by the Mauritius Wildlife Conservation Foundation (MWF) in partnership with the National Parks and Conservation Service, Mauritius. In particular it highlights the support from Chester Zoo and other conservation organisations in assisting this programme, both through staff involvement and financial support. This account expands and updates an article previously published by the European Association of Zoos and Aquaria (EAZA) in Proceedings of the EAZA Conference 2004. Chester Zoo is also assisting other conservation initiatives on Mauritius, including providing technical and financial support for the Mauritius Fody Foudia rubra and the Olive White-eye Zosterops olivacea recovery programmes and has assisted with financial support for veterinary research on the Pink Pigeon ColumbamayeriColumba mayeriColumbamayeriColumbaNesoenasColumba (Nesoenas) mayeri. More recently financial and staff support has been provided for projects on the conservation of threatened endemic plants. In the Mascarenes, Chester Zoo continues to support research on the Rodrigues Fruit Bat Pteropus rodricensis and through Shoals Rodrigues also helps to finance both marine conservation and community initiatives. Chester Zoo is one of several organisations supporting the Echo Parakeet conservation project. The Durrell Wildlife Conservation Trust (Jersey Zoo) is the major sponsor of the Mauritius Wildlife Foundation and significant investments in the Echo Parakeet programme have been made by the World Parrot Trust (WPT), The Parrot Society and the Loro Parque Fundación. I was able to visit Mauritius and Rodrigues in November 2003 when, staying as a house guest of Carl Jones, I learned so much more about these projects through meeting the MWF staff at the field sites. This was especially the case regarding the conservation programme for the Echo Parakeet. I had several enjoyable days accompanying members of the Echo Parakeet team in the field at the most critical time during that year's Echo Parakeet breeding season. The Echo Parakeet, which is Critically Endangered, occurs only on Mauritius. In 1986 only eight to 12 birds were known, and only two or three of these were females, although a few other birds may have been overlooked. These were restricted to the Black River gorges and surrounding forests, an area that in 1993 was designated the country's first national park. It was set up to conserve the Mauritius Kestrel Falco punctatus, Echo Parakeet, Pink Pigeon and other native wildlife. 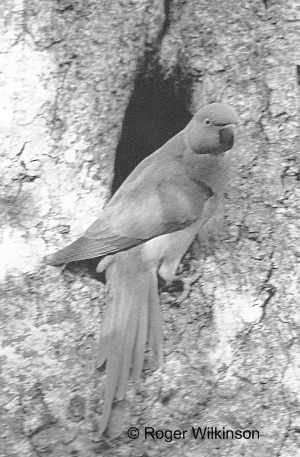 Further research in 1994 and 1995 gave an estimate of 30 Echo Parakeets in the wild. Although a considerable improvement on the previous estimate, this larger estimate still suggested that extinction was imminent unless immediate conservation attention was focused on this species. Under the guidance of Carl Jones, the Scientific Director of the MWF, and with integrated wild and captive management, the Echo Parakeet recovery has been extremely successful. Through a combination of the release of captive-bred birds and active management of the wild population, by April 2006 the number of birds in the wild had increased to 300-320 individuals. Conservation management is focused on the Echo Parakeets living in the wild, with back-up captive breeding and captive rearing facilities for young birds rescued/harvested from the wild. The field work is coordinated by Jason Malham, a New Zealander, and the Echo Parakeet programme has close interactions with staff of the New Zealand Department of Conservation, with benefits to both as a result of sharing experiences and ideas for recovery programmes for island birds. The captive facilities are managed by Frederique Koenig, a Mauritian trained at Jersey Zoo, who has run the captive facilities for several years. During my visit the hand-rearing of both captive­ bred and rescued wild-hatched chicks was managed by Ryan Watson, from Adelaide Zoo, Australia. Ryan is one of a number of staff members from Adelaide Zoo, who over the years have assisted the MWF conservation programmes. In the 2004-2005 breeding season, for example, Heidi Groffen and Pat Hodgens from Adelaide Zoo assisted with releases and hand-raised birds respectively. 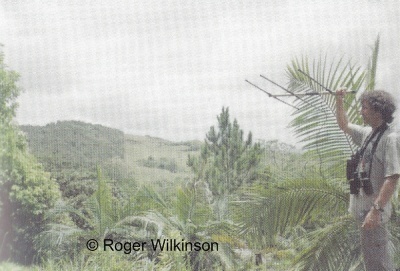 Prior to this, between 1997-1998, Paradise Park, Cornwall, home of the World Parrot Trust, seconded Kirsty Jenkin, Nick Reynolds, Dale Jackson and Pete Haverson to assist with the Echo Parakeet programme on Mauritius. Management in the wild, includes checking nest site activities, the provision of artificial nest cavities, nest monitoring and clutch and brood manipulations, supplementary feeding and monitoring of released birds and predator control. Echo Parakeet nest cavities may be taken over by other birds including the White-tailed Tropicbird Phaethon lepturus. The latter is discouraged by fixing branches across the entrance to nest cavities, thereby making access to them difficult for this species. Unusual nest predators include the large African snail Achatina that has on several occasions 'slimed' young chicks to death in the nest. Areas of the tree trunk above and below the nest entrance are covered in wrap around plastic sheeting that is greased to discourage nest predators, such as monkeys and rats, that may climb up to the nests. The Black Rat Rattus rattus is kept under control by poisoning and trapping in areas close to active nest sites. Artificial nests of several different designs are also provided, as the number of suitable natural nest sites is limited and competition for these may limit the number of breeding pairs in an area. The nests are inspected daily and records kept of egg-laying, hatch dates and chick development. This necessitates tree climbing and both Jason and the rest of the field team are skilled climbers. Chicks are weighed and any that weigh less than 20% of the average weight for chicks of their age are removed for hand-rearing. Rescued chicks are transported to the Gerald Durrell Endemic Wildlife Sanctuary (GDEWS) and after being hand-reared there are released back into the wild. Supplementary feeding is through pole-mounted hoppers containing commercially manufactured parrot pellets. The Echo Parakeets learn to lift up the lids of these hoppers so as to feed. The lids prevent the pellets being taken by other birds and mammals. Direct financial support to MWF in terms of grants between 2000-2005 for Echo Parakeet programme support, including the construction of release aviaries, amounted to over £29,000 (approx. US$54,000). Costs related to Chester Zoo staff working on Mauritius (but excluding their salaries), whilst seconded from Chester Zoo, take these costs to well over £40,000 (approx. US$75,000) over the six years we have been supporting this programme. Most of these costs have previously been met from our conservation budget, that is itself derived from visitor revenue to the zoo. This allows us to inform our zoo visitors that their visit directly supports field conservation. In 2004 and 2005 the funds for the keeper assistance and day to day cover in their absence came from the hugely successful Keeper for a Day scheme (in which members of the public pay to be a keeper for a day) run by the Chester Zoo keeping staff. This financial and staff investment has provided ignificant benefit to this programme and directly links to the zoo's conservation mission. This support is perhaps unusual in that much of Chester Zoo's conservation outreach focuses on threatened species we hold in the zoo. We do not presently hold any Echo Parakeets, although we hope that we may in the future. Through the Echo Parakeet work we support a Critically Endangered species that we do not currently hold and export our staff expertise to assist this conservation programme. Anne Morris was our first staff member to work on Mauritius and spent three months at the Black River Aviaries (now the Gerald Durrell Endemic Wildlife Sanctuary), where her main task was hand-rearing Echo Parakeets. Anne and her husband Paul have many years' experience of parrot husbandry and of hand-rearing parrots at Chester Zoo, and this was a real opportunity for those skills to be directly applied to parrot conservation in the wild. The facilities and protocols for hand-rearing parrots at the GDEWS are excellent and gave Anne new insights into best practise for parrot rearing. Anne then stayed on longer at Black River and worked with the team releasing the birds she had reared. This greatly assisted the release process and generated real personal satisfaction for her in seeing the birds she had reared being successfully released. In 2003, two more of our bird keepers, Paul Morris and Clare Daniel, were seconded to MWF for a combined period of over three months and worked with staff releasing hand-reared birds. The release process involves a soft release that requires a combination of keeper skills and knowledge of how the birds behave. After having been hand-reared, the parakeets are first accustomed to their release aviaries and then the behaviour of the released birds is carefully monitored. Again this is an area in which our staff members' experience and skills are uniquely appropriate to assist this most important parrot conservation programme. Paul returned to Mauritius to assist with field work on the Echo Parakeets during the 2004-2005 breeding season. Chester Zoo staff involvement in this project has been beneficial to Echo Parakeet conservation, the MWF and Chester Zoo. This involvement has benefited our staff in terms of their personal experience in working with a team of wildlife conservationists abroad and applying and developing their skills in a new situation. It has also given them the new experience of working field conservation and benefits Chester Zoo through their increased experience that can be communicated to other staff members and our public. The conservation mission of Chester Zoo then becomes real to our keepers and not abstract. They can really say that they have helped save the Echo Parakeet from extinction. The Mauritius Wildlife Foundation is very happy with the close relationship that has developed with Chester Zoo and the other collections in developing this project. 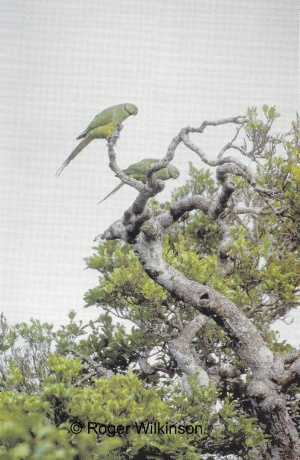 In the 1980s the Echo Parakeet was regarded by many as a hopeless case, but due to the international effort described above and the close involvement ofthe National Parks and Conservation Services on Mauritius, this has become one of the most successful parrot restoration programmes in the world and provides an important example for the conservation of other endangered parrots. I am grateful to Carl Jones, who has been instrumental in saving many Mauritian species from extinction, for correcting and adding to a previous version of this article. I also wish to thank Paul Morris, Anne Morris and Clare Daniel for information on their experiences whilst seconded on Mauritius. The whole Echo Parakeet team, past and present, deserve our thanks for working against all odds and under often arduous conditions, to ensure the survival of the Echo Parakeet in the forests of Mauritius. Finally thanks to the Durrell Wildlife Conservation Trust, Chester Zoo, Paradise Park, Adelaide Zoo, the World Parrot Trust, Loro Parque Fundación and the many other supporters, with apologies to those not named, that have enabled this conservation work to proceed. Jones, C. G. 2004. Conservation and Management of Endangered Birds. In: Sutherland, W. J., Newton, I and Green, R. E. Bird Ecology and Conservation. A Handbook of Techniques, Chapter 12, pp.269-301. Oxford University Press, Oxford, UK. Malham, J., Reuleaux,A., Buckland, S., van de Wetering, J., Sawmy, S. and Bowkett, R. 2004. Management of Echo Parakeets in the Wild 2003/2004. In: Echo Parakeet Management Report 2004. Unpublished report to Durrell Wildlife Conservation Trust, World Parrot Trust, Chester Zoo and Conservation Service of Mauritius and Mauritius Wildlife Foundation. Plant, A., Groffen, H. and Hodgens, P. 2005. 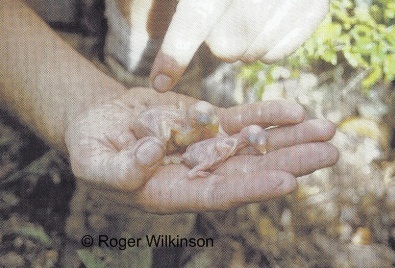 The Release of Echo Parakeets in the Wild 2004/ 2005. In: Echo Parakeet Management Report 2005. Unpublished report to the Durrell Wildlife Conservation Trust, Chester Zoo, World Parrot Trust, IBL Limited, General Construction, National Parks and Conservation Service of Mauritius and Mauritian Wildlife Foundation. Reuleaux, A., Malham, J., Morris, P., Daniel, C., van de Wetering, J., Buckland, S., Sawmy, S. and Bowkett, R. 2004. The release of Echo Parakeets at Bel Ombre 2003/2004. In: Echo Parakeet Management Report 2004. Unpublished report to Durrel! Wildlife Conservation Trust, World Parrot Trust, Chester Zoo and Conservation Service of Mauritius and Mauritius Wildlife Foundation. Wilkinson, R. 2005. 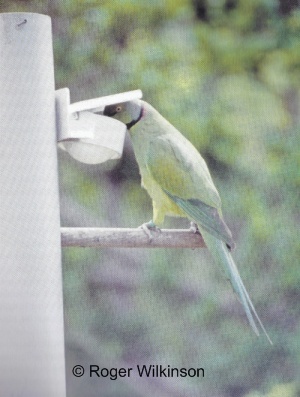 The Mauritius Wildlife Foundation echo parakeet programme and zoo conservation support. In: Hiddinga, B. (ed.) Proceedings of the EAZA Conference 2004, Kolmarden, pp.200-202. EAZA Executive Office, Amsterdam. Dr Roger Wilkinson is Head of Science and Conservation, Chester Zoo, Upton-by-Chester, Chester CH2 lLH, UK. Roger is an Avicultural Society Vice President.